By Julio G. Martinez-Clark, bioccess.™CEO; article originally published by Med Device Online. 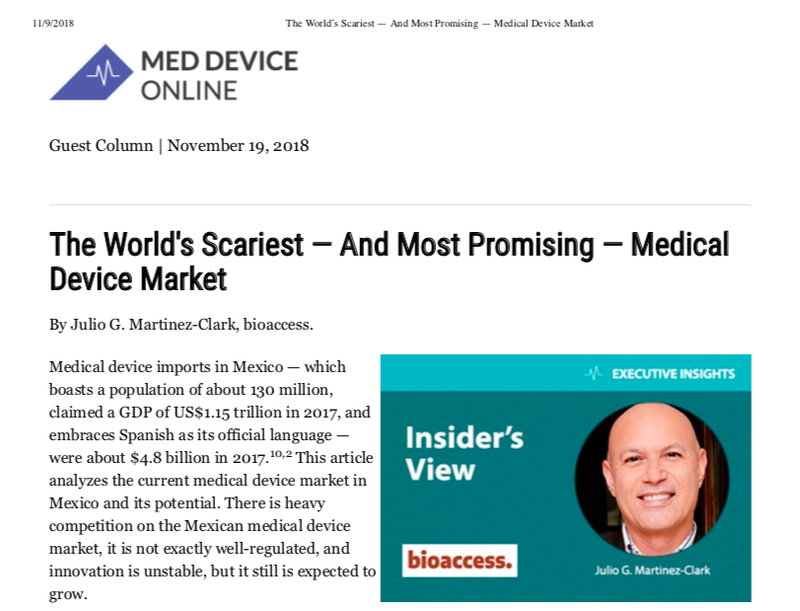 Medical device imports in Mexico — which boasts a population of about 130 million, claimed a GDP of US$1.15 trillion in 2017, and embraces Spanish as its official language — were about $4.8 billion in 2017. (10,2) This article analyzes the current medical device market in Mexico and its potential. There is heavy competition on the Mexican medical device market, it is not exactly well-regulated, and innovation is unstable, but it still is expected to grow. Most large hospitals in Mexico desire modern and specialized medical devices. Due to limited budgets, some private hospitals buy used or refurbished equipment, but current regulations prevent public hospitals from buying used or refurbished products. This forces many public hospitals to hire companies that offer and provide service “per event,” offering all products required to perform a procedure. (3) Thus, foreign medical device manufacturers may have to work with local distribution partners to provide packaged services when trying to sell to underfunded hospitals in Mexico, increasing the complexity of selling devices there. A medical device marketing authorization in Mexico is valid for five years and is granted to a local entity; it allows the holder to market the medical device in the national territory. In most cases, a review process is necessary, which can take from six to twelve months if it’s conducted by COFEPRIS — or about four months, if the review is conducted by a private third-party authorized by COFEPRIS. Medical device companies in Mexico can freely set the price-to-market without any regulation or benchmarking. However, the number of competitors — and the fact that the private and public sectors’ decision to purchase is mostly based on price — mean that original prices often are modified. In general, coverage policies are defined for procedures and don ́t specify device brand or model, and for that reason the healthcare system may reimburse without explicit one-by-one device evaluation. Mexico’s healthcare system allows the adoption of medical devices without individual comprehensive assessment. According to the World Economic Situation and Prospects 2018,9 the Mexican Medtech market’s risks include dull GDP growth, with consistent growth rates of less than 3 percent,(10) including just 2 percent growth in 2018. (2) All of Latin America has felt the impact of weakening local currencies, and healthcare has had little alternative but to import from abroad. The Latin American medical device industry is affected by unstable economic, political, and social environments. Despite this hardship, the industry expects some growth. In Mexico, that optimism is fueled by an expanding middle class, widespread chronic disease, and an aging population. Still, with that opportunity comes risk in the form of extreme competition for the local market, corruption, complicated administrative procedures, currency fluctuations, accounts receivables with distributors, etc. Julio G. Martinez-Clark is CEO of bioaccess, a U.S.-based contract research, regulatory, and market access consulting company focused on Latin America. Julio holds a bachelor’s degree in electrical engineering (B.S.E.E. ), and a master’s degree in business administration (M.B.A.). 3. 2016 Top Markets Report Medical Devices Country Case Study Mexico. 17. Obesity prevalence in Mexico: Impact on health and economic burden. Retrieved from https://www.cambridge.org/core/journals/public-health-nutrition/article/obesity-prevalence-in-mexico-impact-on-health-and-economic-burden/94533D50B7FACF869C887F0D77A04A07.